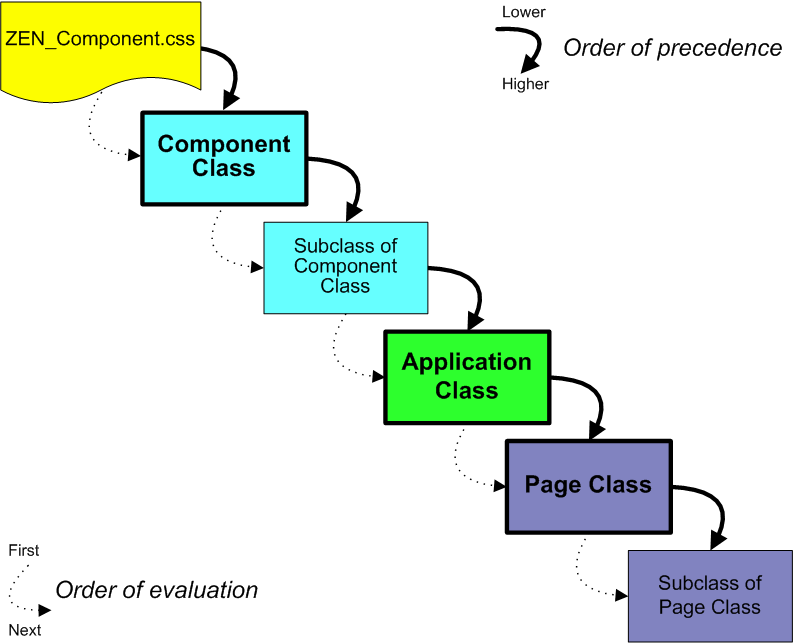 The chapter Zen Layout explains how to place Zen components on the page. To do this, you provide an XData Contents block in the page class and fill it with XML elements that represent Zen components. Setting style attributes while placing XML elements in the XData Contents block. Applying Cascading Style Sheet (CSS) style definitions in an XData Style block. Referencing external CSS files in a variety of ways. align Possible values are "left", "right", or "center". This becomes the align value for the <td> element that contains the child component in the generated HTML. condition Server-side expression that, if true, allows this component to be added to the set of page components. This server-only attribute is not defined on the client side. Overrides the parent group’s cellStyle, to provide extra padding or alignment values for the <td> element that contains the child component in the generated HTML. enclosingClass Name of a CSS style class. When Zen lays out this group, it applies this style to the component’s enclosing <div> element. When Zen lays out this group, it applies this style to the component’s enclosing <div> element. height CSS length value (integer or percentage). This becomes the height value for the <td> element that contains the child component in the generated HTML. If true, the component is hidden (placed on the page, but not displayed). If the status of a component is hidden, its label text (if any) is also hidden. The default is false. This attribute has the underlying data type %ZEN.Datatype.boolean. It has the value "true" or "false" in XData Contents, 1 or 0 in server-side code, true or false in client-side code. The hidden value can be a literal string, or it can contain a Zen #()# runtime expression. The hint attribute supplies additional text that displays below the component. The hint text can be styled, using the hintClass and hintStyle attributes. Although you can enter ordinary text for this attribute, it has the underlying data type %ZEN.Datatype.caption. This makes it easy to localize its text into other languages, as long as a language DOMAIN parameter is defined in the Zen page class. The %ZEN.Datatype.caption data type also enables you to use $$$Text macros when you assign values to the label property from client-side or server-side code. hintClass CSS class to apply to the hint. hintStyle CSS style to apply to the hint. id This value can be used to select a CSS style definition for the component. It becomes the id value for the component’s enclosing <div> element. Comma-separated list of additional component classes that this component needs to have defined on the client side. Use import for cases in which the client needs classes that are not directly defined in the original object tree. This server-only attribute is not defined on the client side. A text label for the component. The component simply supplies the label text. Styles for laying out this label are the responsibility of the component’s parent group. For details about this, see the showLabel description in this section. labelClass Name of a CSS style class. When Zen lays out this group, it applies this style to the label displayed for the component. When Zen lays out this group, it applies this style to the label displayed for the component. name Specifies the name of the component. Typically, this is used to identify a control within a form. See the Zen Forms chapter in Using Zen Components. Server-side expression that determines if this component should be added to the set of page components. This server-only attribute is not defined on the client side. If a resource is specified, the current user must hold USE privileges on this resource or the component is not added to the set of page components. If you are not familiar with Caché resources, see the Assets and Resources chapter in the Caché Security Administration Guide. If true, Zen displays the label for this component. If false, it does not. The default is true. The showLabel attribute has the underlying data type %ZEN.Datatype.boolean. It has the value "true" or "false" in XData Contents, 1 or 0 in server-side code, true or false in client-side code. For information of the interaction of showLabel with a containing group, see the discussion that follows this table. slice Used when this component’s parent group has a cellSize value of "stretch", slice is an integer value indicating the size of this component relative to other components within the group. Zen computes this size by dividing this component’s slice value by the sum of all slice values for all child components in the same group. The minimum value for slice is 0. Help text that displays as a tooltip when the user hovers the mouse over this component (or its label). Also see the hint attribute. Although you can enter ordinary text for this attribute, it has the underlying data type %ZEN.Datatype.caption. This makes it easy to localize its text into other languages, as long as a language DOMAIN parameter is defined in the Zen page class. The %ZEN.Datatype.caption data type also enables you to use $$$Text macros when you assign values to the title property from client-side or server-side code. valign Possible values are "top", "bottom", or "middle". This becomes the valign value for the <td> element that contains the child component in the generated HTML. width CSS length value (integer or percentage). It may be "*" to indicate that the element should take up the remaining space in the layout table. This becomes the width value for the <td> element that contains the child component in the generated HTML. If a component, such as a control, is displayed within a group, such as a form, the component’s label and showLabel attributes interact with the group’s layout, labelPosition, and cellStyle attributes. Then while laying out the page, the Zen layout manager adds the space allocated for the child component’s label to the total width allowed for the component within the group. Any style information in the cellStyle for the group also applies to the table cell that has been reserved for laying out the component label. This is the case even when showLabel is false for that component (that is, if no label actually appears in the space allowed for it). You can use this to your advantage in laying out different areas within a group. To facilitate use of CSS styles as well as dynamic HTML, every Zen component that you place on a Zen page is enclosed within an <div> element on the generated HTML page. This is the enclosing <div> for the component. When a component is within a composite component, the conventions for creating an HTML id are a bit different. Zen prepends the composite’s id string to the name used for the component. If the composite does not have an id, Zen manufactures one by prepending the letters id to the index number of the component on the page. To define styles for the application class shown above, you would add CSS statements between the <style type="text/css"> tag and the closing </style> tag. The following example shows an XData Style block in a page class. This class defines styles in the XData Style block and then references them from XData Contents by using the id attribute with components. The following example defines and then references the styles title, vg1, and vg2. The following table explains the effect of class inheritance on XData Style. Yes No Child inherits XData Style from the parent. Yes Yes Child inherits all of the styles defined in the XData Style block of the parent class. If any of these styles are redefined in the child class, the style definition in the child class takes precedence. No Yes Child uses its own XData Style definition. No No Some parent of both classes probably defines XData Style. If not, the browser applies its own style defaults. Styles defined by the CSS files for the Zen component library. The filenames have the form:ZEN_Component_*.css. Styles defined by base component classes. The default styles for the built-in Zen components are provided via an XData Style block in the corresponding %ZEN.Component class (or one of its parents). However, if you want to change the style of a built-in Zen component, do not edit the class directly. Either subclass the component to create a custom component, or override the corresponding style definitions in the page or application class. Styles defined by subclasses of base component classes (that is, custom components). Any subclass of %ZEN.Component.component can provide an XData Style block. If the child has an XData Style block, this replaces the XData Style from the parent class. If not, the child inherits XData Style from the parent. A reference to an external CSS file using the CSSINCLUDES parameter. The following diagram gives a general idea of where styles originate. For details, see the previous list. This order of precedence makes it easier to ensure a consistent look and feel for your application. You can override the style definition within the application class (for an application-wide style override), within a template page class (to override a value for a suite of pages) or within an ordinary page class (to override a value for a specific page). The following XData Style block changes the background color, border style, and font family choices for a CSS rule called table.tpTable. How did the developer choose this rule to change? How does this XData Style block fit into the cascade of styles? And why did the developer choose to provide an XData Style block rather than an external CSS file? The next several sections provide answers. Somewhere in the inheritance tree for each Zen component, there is an XData Style block that defines the CSS rules for this component. To find the correct one, usually you must know something about the inheritance of the component class. For example, %ZEN.Component.tablePane inherits from %ZEN.Component.simpleTablePane. It is the simpleTablePane class that contains the relevant XData Style block. There is no XData Style block in the tablePane class. From Studio, choose Tools > Class Browser. Under the %ZEN.Component package, find the class you are interested in. Right-click on the class name and choose Documentation. Start the InterSystems online documentation. Choose Class Reference from the navigation bar near the top of the page. Choose the %SYS namespace and %ZEN.Component package. Click on the class name. Once you have found the documentation page for the class of interest, see if it inherits from another Zen component class. If so, the XData Style block is probably in the parent class. You can click on the parent class name to navigate to its documentation page. In Studio, in the %SYS namespace and %ZEN.Component package, open the component class for viewing. Find its XData Style block or that of its parent, and see what CSS rules it contains. C:\MyCache\CSP\broker\. The filenames have the form: ZEN_Component_*.css. The text following the underscore helps you determine which file to examine. To effectively predict the results of your changes, keep in mind the order of precedence rules described in the Cascade of Styles section. The following table restates these rules in terms of the results that you are trying to accomplish. Application-wide styling rules. You can override these styles in template pages or in individual page classes. Place the revised CSS rule in an external CSS file and reference from the application class using the CSSINCLUDES class parameter. Place an XData Style block in the application class and place the revised CSS rule definition within it. You can either type rule syntax into XData Style or use the Zen Style Wizard for convenient style editing. If there are style conflicts between XData Style and CSSINCLUDES for the application, XData Style takes precedence. Styles that apply to a group of pages within an application. You can override these styles in individual page classes. Create a template page class. Ensure that all the pages you want to have consistent style are subclasses of this template page. Place the revised CSS rule in an external CSS file and reference from the template page class using the CSSINCLUDES class parameter. Place an XData Style block in the template page class and place the revised CSS rule definition within it. You can either type rule syntax into XData Style or use the Zen Style Wizard for convenient style editing. If there are style conflicts between XData Style and CSSINCLUDES for the template page class, XData Style takes precedence. Styles that apply to only one page within an application. Place the revised CSS rule in an external CSS file and reference from the page class using the CSSINCLUDES class parameter. Place an XData Style block in the page class and place the revised CSS rule definition within it. You can either type rule syntax into XData Style or use the Zen Style Wizard for convenient style editing. If there are style conflicts between XData Style and CSSINCLUDES for the page class, XData Style takes precedence. Styles that apply to all instances of a particular component. Any styles defined in application or page classes automatically override styles defined in component classes, so for stylistic consistency and control you should make changes near the end of the cascade, in the application or page class, rather than in the component class. However, if you wish, you may create a custom component that is a subclass of the built-in Zen component whose styles you wish to change. Place an XData Style block in the custom component class and place the revised CSS rule definition within this XData Style. You can either type rule syntax into XData Style or use the Zen Style Wizard for convenient style editing. In any case, do not edit the XData Style block in a built-in Zen component class or its parent. Do not edit the built-in stylesheet files. These files have names in the form: ZEN_Component_*.css. Changes of this kind are lost next time you upgrade the Caché server version. The above topics explain how to modify styles that are already in use by a built-in Zen component. If you want to define an entirely new CSS style (with a new name) and apply that style to a component, there are additional steps to perform. In that case you must not only subclass the component and define the CSS style, but also reference that CSS style from the portion of the subclass that renders the component on the page as HTML. For details about these steps, see the Custom Components chapter in the book Developing Zen Applications.